Disclosure: I was sent these products to review free of charge from Shindigz Party Supplies. All opinions in this post are my own. I did not receive any other compensation for this review. I added links to the particular products for your convenience, but not for any compensation. 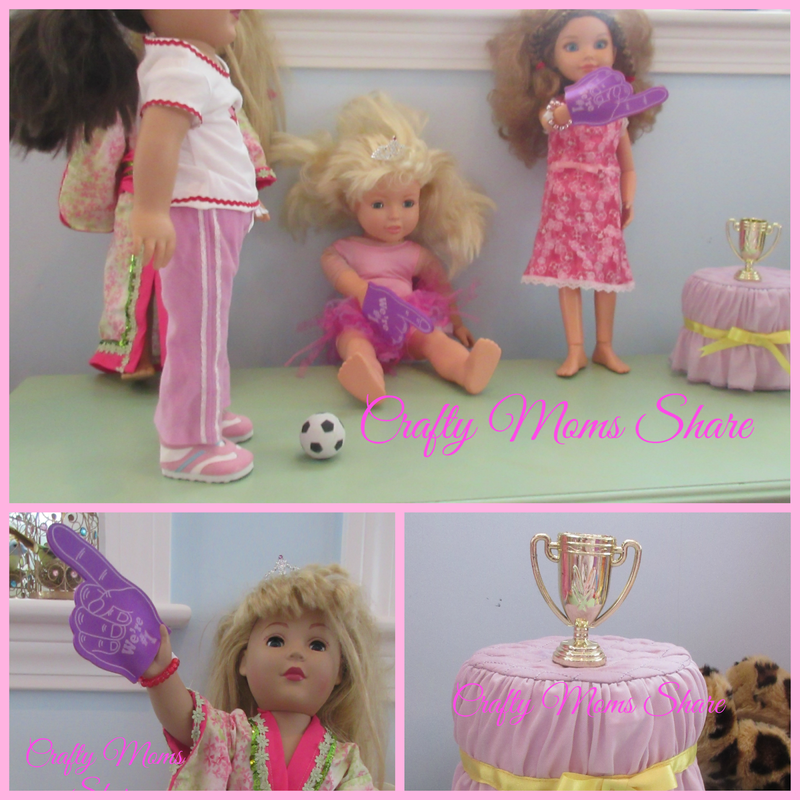 Yesterday I received an email from Shindigz informing me that my DIY American Girl Themed Party had won an award (you can see the award badge on the post). I responded what a coincidence since I was about to write a review of Shindigz products to use with an 18-inch doll. So yes, here are some ideas of party supplies that work with 18-inch dolls like American Girl dolls. 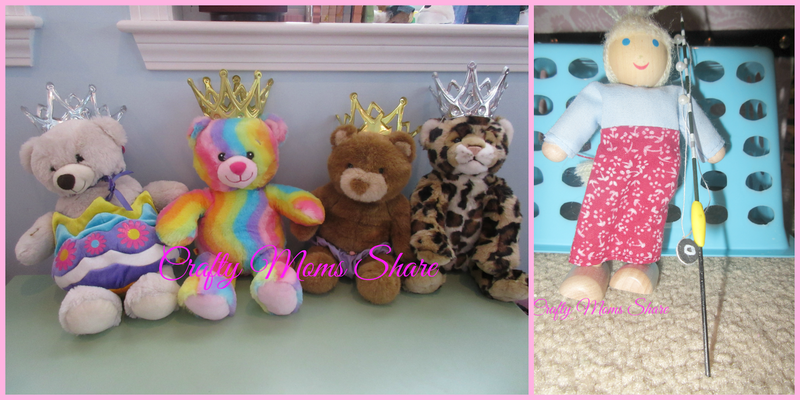 We are getting ready for a Valentine themed Doll Play Date later this week. Hazel invited a few of her friends and their dolls over. 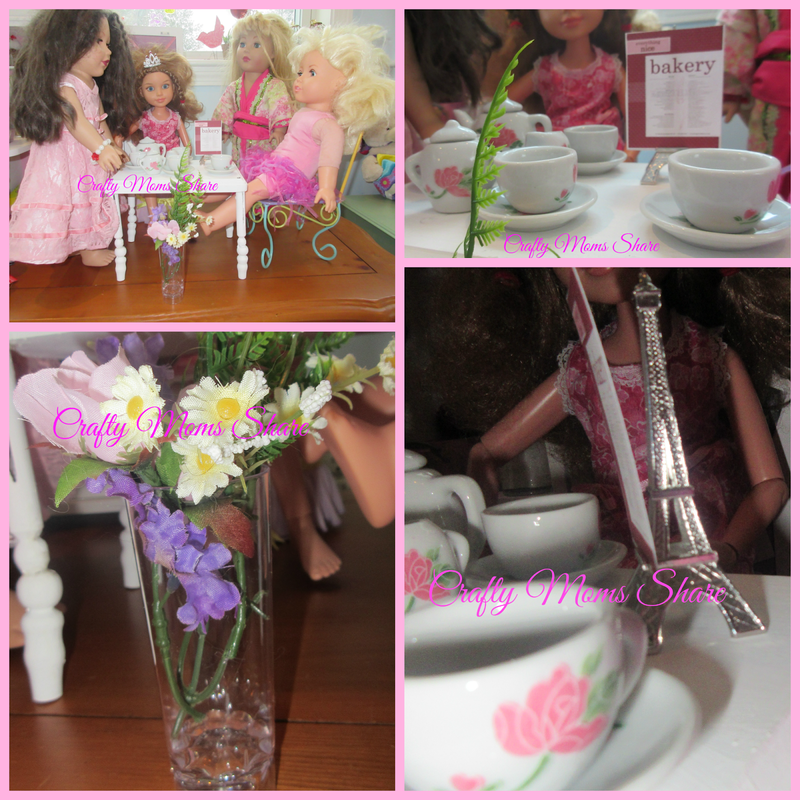 We are planning on having a tea party with the dolls. First of course all the dolls need tiaras. 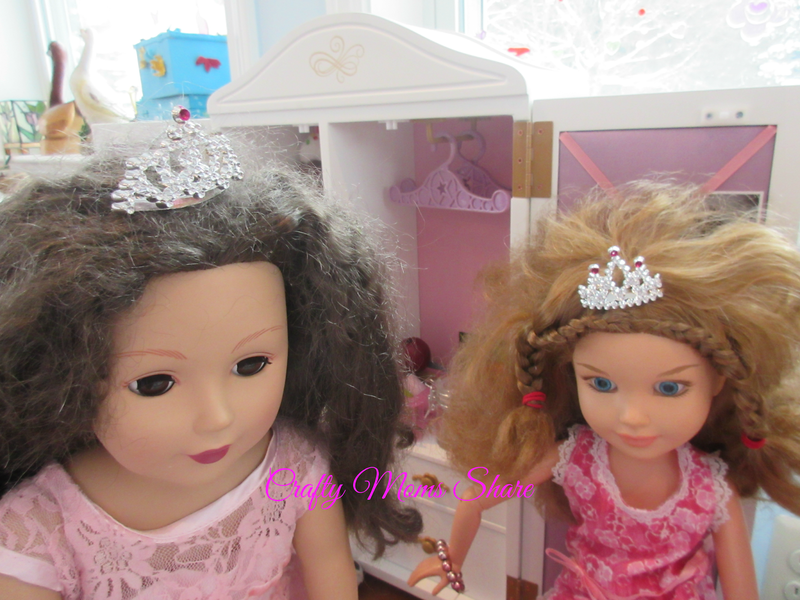 These mini tiara combs are the perfect size for the dolls. Since Hazel's dolls were having a tea party and game night first, Hazel dressed them in outfits of her choice. We also need to redo some of their hairdos. 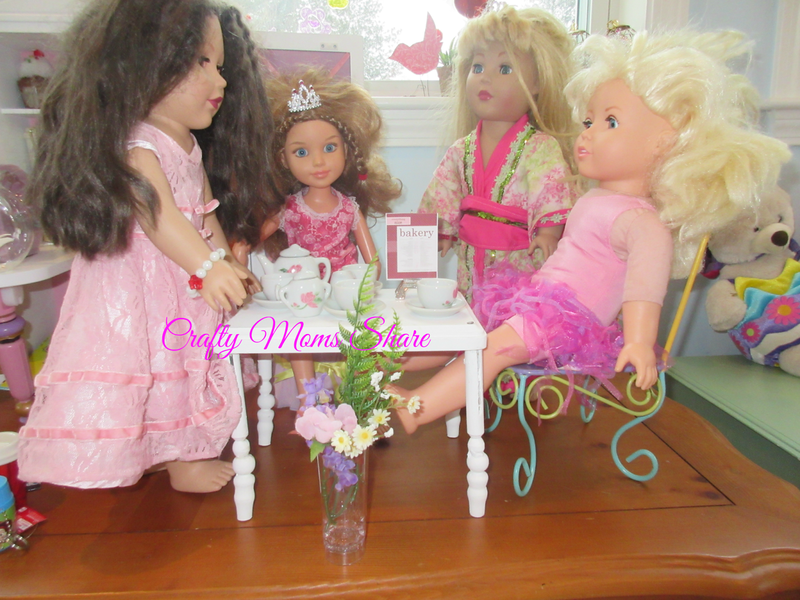 Now Hazel's doll, Hazel, invited the other dolls over for a tea party. She has a lovely ceramic tea set. Plus she had some pretty flowers to put near the table. The vase is a mini clear cordial glass. We were going to make flowers for the vase, but instead used some small fake flowers that we had. In honor of the American Girl Doll of the Year, Grace, we also had a bakery menu on an Eiffel Tower stand. It is one of the Evening in Paris Eiffel Tower Place Card Holders. 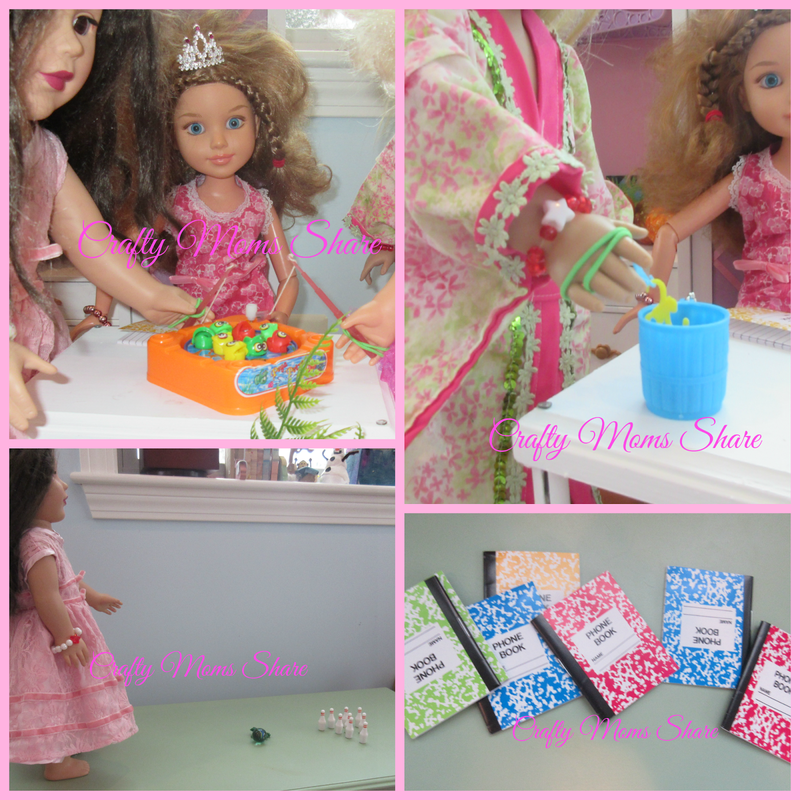 We actually won a giveaway over at Doll Diaries of souvenirs from her visit to see Grace at the beginning of the year. We haven't gotten them yet, but Hazel is so excited and I see French bakery inour play time soon. After having a little tea, the girls wanted to make some music. They pulled out their tambourines and maracas. 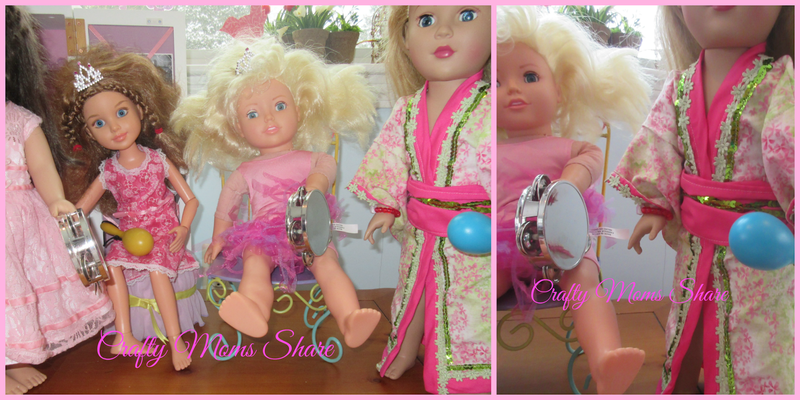 The tambourines are the Silver Tambourine Noisemakers from Shindigz. We already had the maracas, but they are similar to these metallic maracas. After a little music, the girls wanted to play some games. They played a magnetic fishing game (Wind Up Fishing Game). This is Hazel's favorite! Then they played a Barrel of Monkeys. We got the Toy Story Monkey Game Key Chain and took the sticker and key chain attachment off. Next it was time for bowling. The Mini Bowling Game is really too small, but Hazel loves it anyway. To keep score (or start school) we used the mini composition books (Mini Phone Book Favors). After all the games it was time for Hazel to change for her soccer game. The girls all went to cheer her on since it was for the championship trophy. The soccer ball is from the Soccer Ball Key Chain. I pulled the key chain attachment off the ball. (It left a little dent, but it doesn't really show.) The other dolls have their We're #1 Foam Hands on to cheer for Hazel. These are Mini #1 Foam Hands in purple. They come in all sorts of colors. We had the mini trophy, but it is similar to this one. After winning the trophy, Hazel's friends went home and Hazel wanted to do something relaxing. 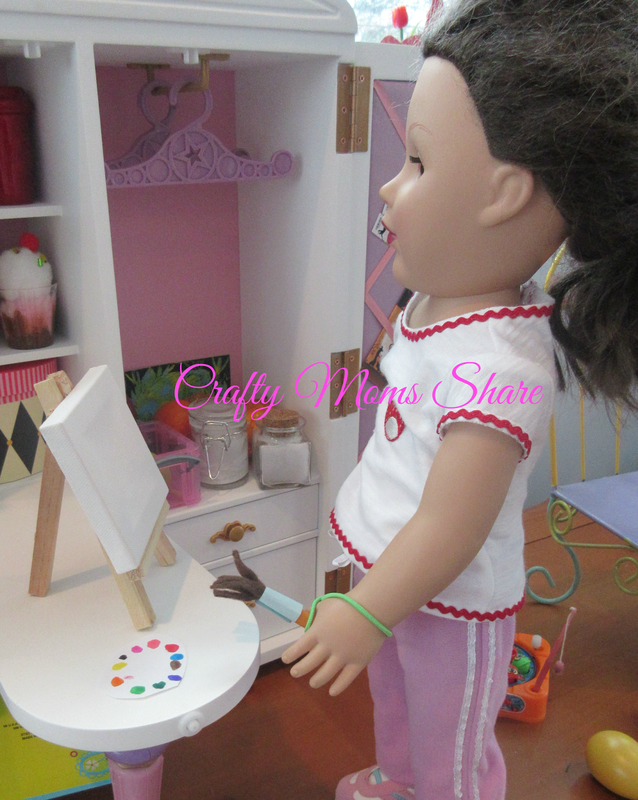 She pulled out her table top easel and paints. The tabletop easel is the Mini Wooden Easel and has a Mini Art Canvas on it. Hazel made a paint brush from a straw, brown felt and some craft tape. We made the paint palette from paper and markers. We also got a few things for Hazel's dolls that do not fit in our story. 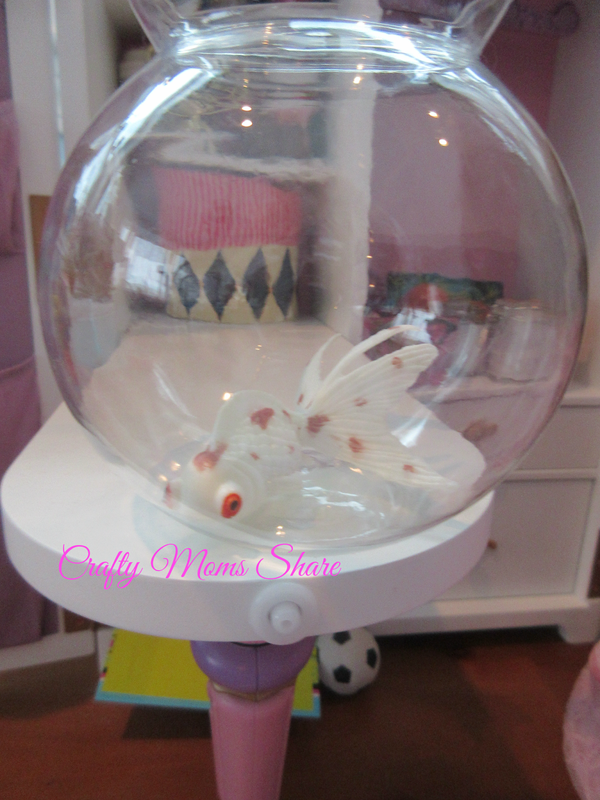 We got a fish bowl for her dolls. 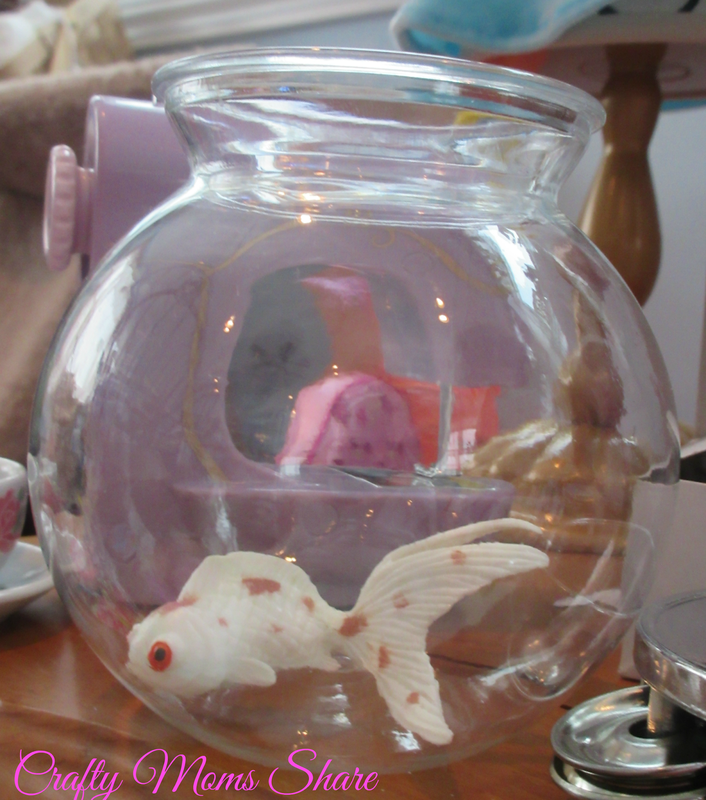 It is the Plastic Fish Bowl. It is slightly too big, but we don't care. Hazel is excited to put her white fish in it. I offered to put fake water in but explained her fish would not be able to come back out and she has not decided if she wants to go that route or not. 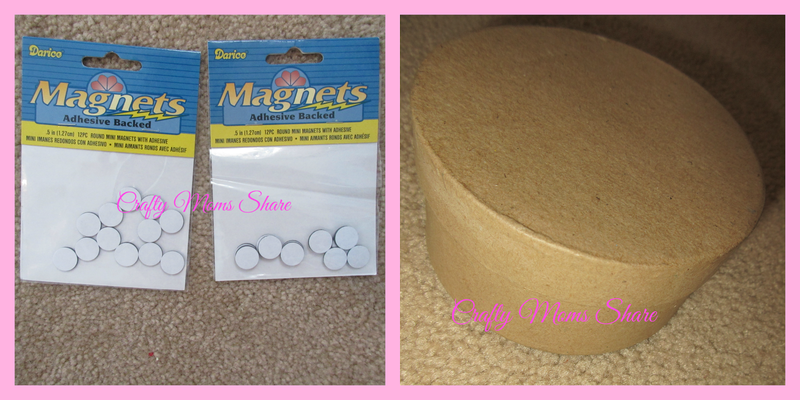 We also made sugar and flour canisters using jars from Shindigz. 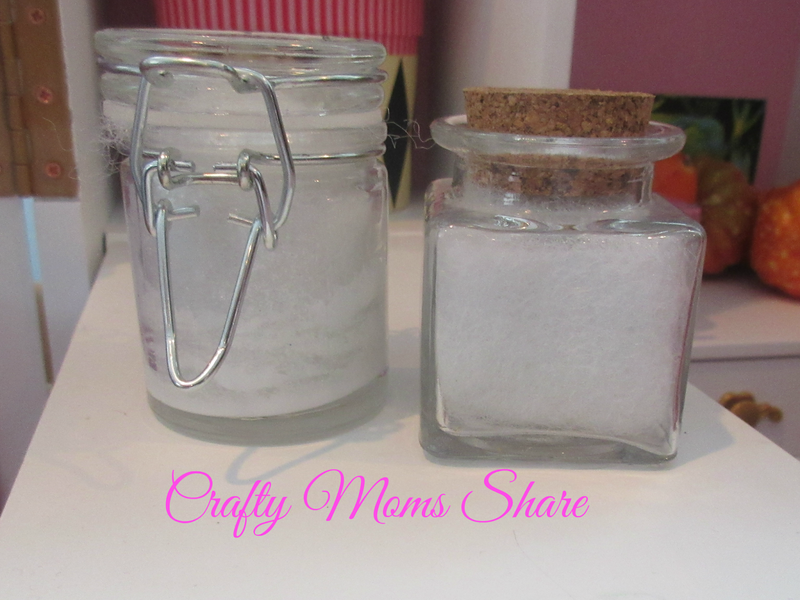 For the sugar (left) we used the Mini Locking Favor Jar and put glue and white glitter on the inside sides. Then we put some polyester stuffing in it and closed it up. For the flour we used the unpersonalized Mini Corked Jar (which I cannot find now for some reason) similar to this personalized one and stuffed it with polyester stuffing. Both of these jars are made of glass. Now I guess I need to make Hazel's dolls a kitchen. 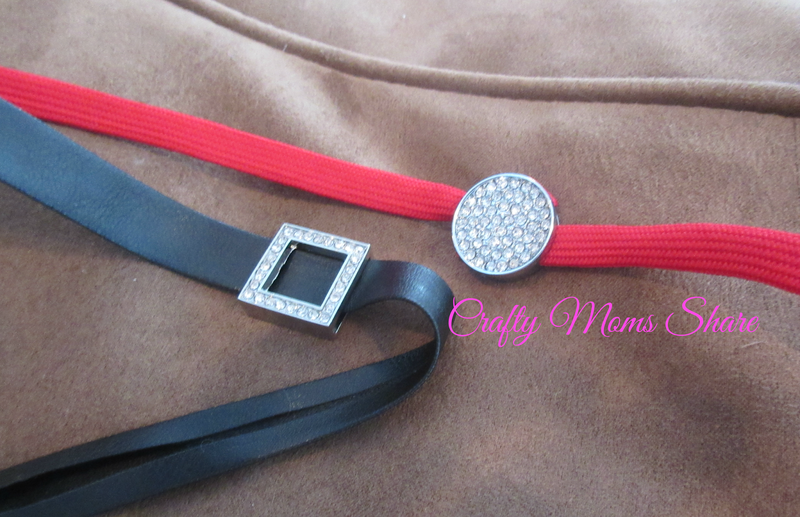 I am making two doll belts with rhinestone buckles I found at Shindigz. The black belt uses the Square Rhinestone Buckle and some trim I got at Joann Fabrics and the red belt uses Round Rhinestone Buckle with some trim from Joann Fabrics as well. I need to sew on the Velcro so they will be easy for Hazel to put on her dolls. We also got a package of Kids 5 Inch Telescopes which are the perfect doll size. Hazel is demonstrating one above. They come in different colors as well. We will be giving some of these to Hazel's friends at our doll play date along with a tambourine and tiara. I made two size mistakes. We ordered the Miniature Crowns, but they looked too big on the dolls unless you wanted a very strict queen who likes to show her power with her crown. However they are the perfect size for Hazel's stuffed animals (all of these shown are from Build-a-Bear for size reference). Then we ordered the Miniature Fishing Pole which is doll house size. We will be using it in one of our dollhouses or for Hazel to play with her dollhouse. We also got some craft supplies we have not used yet. We got these Adhesive Magnets. Hazel keeps telling me she wants to get her Nonni (my mother-in-law) some magnets since she keeps using Hazel's Magnatiles to hang up Hazel's artwork. I figured we could make her some from Hazel's artwork so it will be a double display. Hazel also really wanted this Round Paper Mache Box. She has not decided what she wants to do with it. We talked about making a prayer box or using it as a table or chair for her dolls. She is still thinking about it. Plan on seeing these kind of crafts soon!! 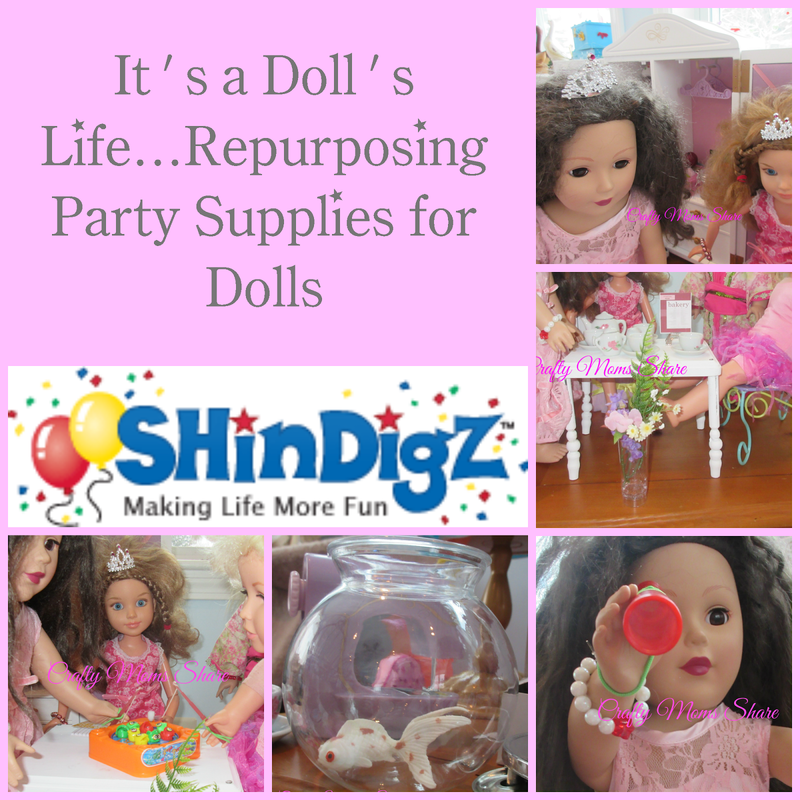 Thank you to Shindigz for sending us such fun doll accessories!! Hazel is loving them! !